I woke up this morning with one question on my mind – How does one dress for monkeys? I don’t mean how should I dress to impress a monkey, but how should I dress in case a monkey jumps on me? This can only mean it was our day to travel to Gibraltar. Gibraltar is part of the British Empire, complete with bobbies and double-decker buses. 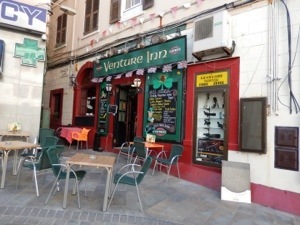 The currency is the pound, but for a fee most merchants are happy to take euros. Before planning this trip I didn’t know Gibraltar was its own nation. I confess I had only heard of the Rock of Gibraltar. In my mind it looked like Alcatraz, i.e., The Rock. This was quite a diffferent experience. To get there, we headed west down Spain’s version of A1A for about 1.5 hours. 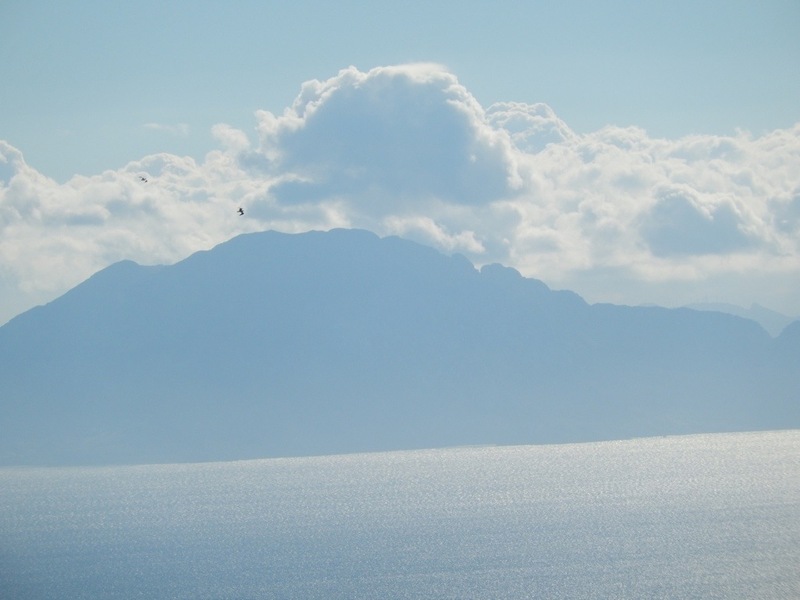 Mountains were to our right and the Med Sea to our left. It’s quite breathtaking. At long last, there it was looming large in the distance. 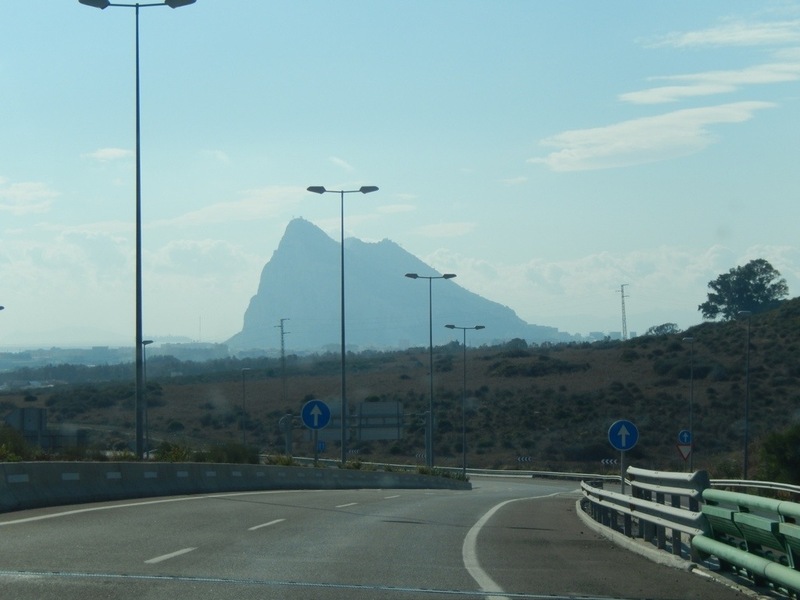 The Rock of Gibraltar is quite a presence. Thanks to Rick Steves’ guidebook, we were prepared to park in Spain and walk across the border. This saved a lot of headaches. To walk across the border you cross a live air strip of the Gibraltar Airport. No planes were coming or going at the time, so that made it a little less exciting. Still it was a strange experience. We traveled through the main square taking in all the Britishness of the place and stopped for a typical British lunch, cottage pie. As we entered the city, taxi drivers and tour guides taunted us to buy their tour. Ha! We laughed at their taunts that we would regret going it on our own. The gondola took all of six minutes to get us to the top viewing area. How I wish we had bought a ticket for the ride down! We were excited to see Africa off in the distance. It was beautiful and seemed to beckon us to come. Sometimes the world seems small and close. The views of Spain were also amazing. 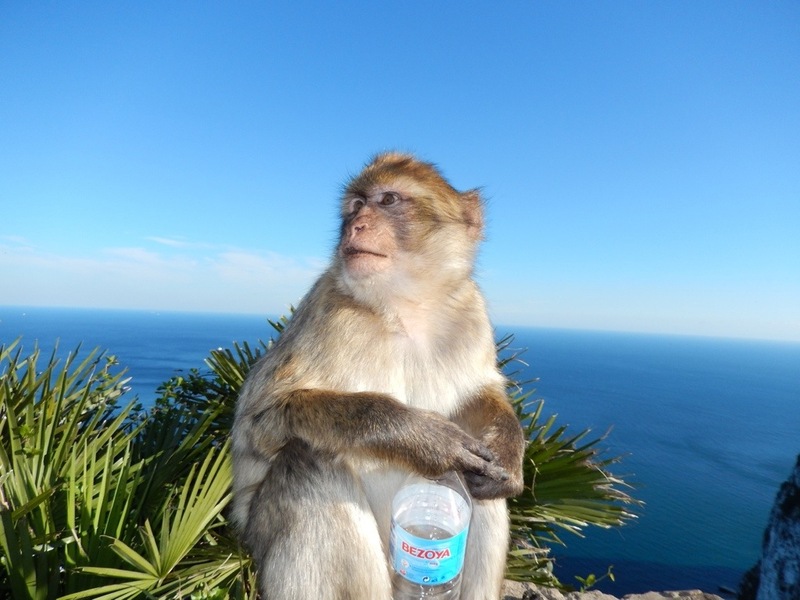 But, we wanted to see monkeys, the famous Gibraltar apes. So, ennough of the landscapes and seascapes, on to the monkeys. Our son, Joe, was on a mission. He really wanted a monkey to jump on him. Honestly, we all did, even Aubyron (our daughter-in-law), but she preferred a small one. 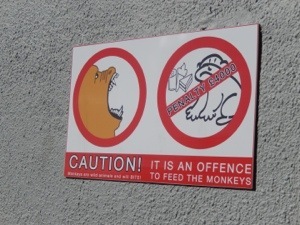 You shouldl know that a large fine will be imposed for anyone taunting, feeding or approaching the apes. They are serious about this. So you just have to make yourself available, you know, hang around the various monkey haunts until one gets curious. We practiced looking nonchalant. Bob was the first to have an encounter, but unfortunately I didn’t see it; but it counts. It was starting to get late and we were in need of more monkey business. 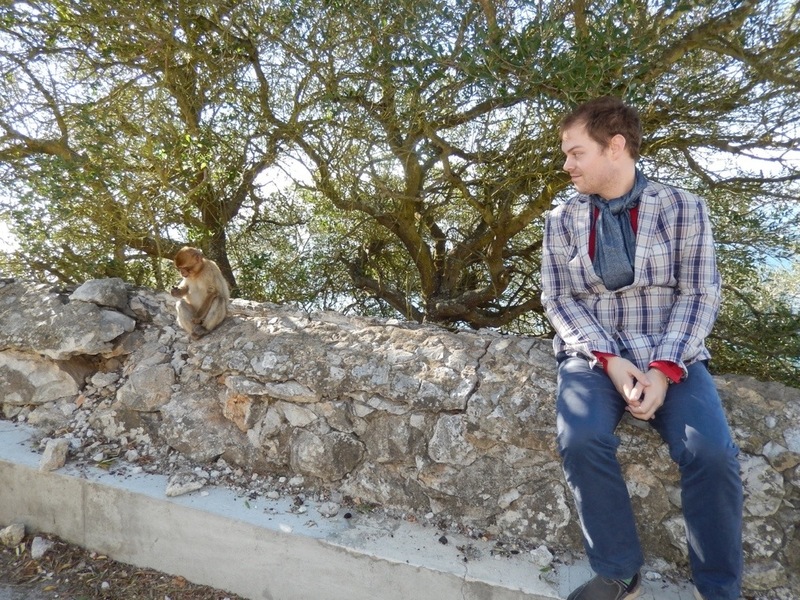 I prayed that God would have a monkey jump on us (yes, I really did). We approached a few and sent out that “hey, we’re just chillin'” vibe. Joe took the high route and Aubyron and I took the low route. I leaned against the wall and looked over the sea with my most I-don’t-care-if you-jump-on-me-or-not attitude. Honestly, for a minute I wasn’t thinking monkey, and then it happened. 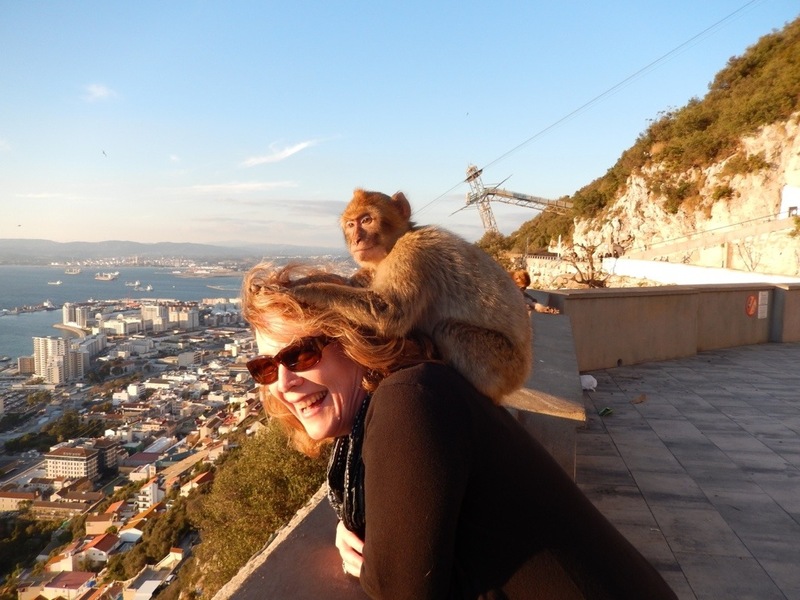 Yes I was groomed by a Barbary macaque (Gibraltar monkey). It was awesome! Not that I want to do this on a regular basis, but how often do you have this opportunity. He was surprisingly light and surprisingly happy to comb through my hair. I had read that if one jumps on you, you should squat down as they like to launch off of people. My monkey was quite content to groom me for about a minute and a half. Cool. Bob and I were ready to go down. Joe was not. He had not had the full monkey experience and was dedicating himself to retaining it. At this point, we separated. Joe and Aubyron went off to see monkeys and find a way down the rock and Bob and I started walking down. I should mention that it was nearly dusk at this time and it appeared as if we would be the ones to lock up the rock. We had not calculated our return trip and I suppose the annoying taxi drivers were indeed getting the last laugh. We started walking down, down, down. There were no other tourists in sight. 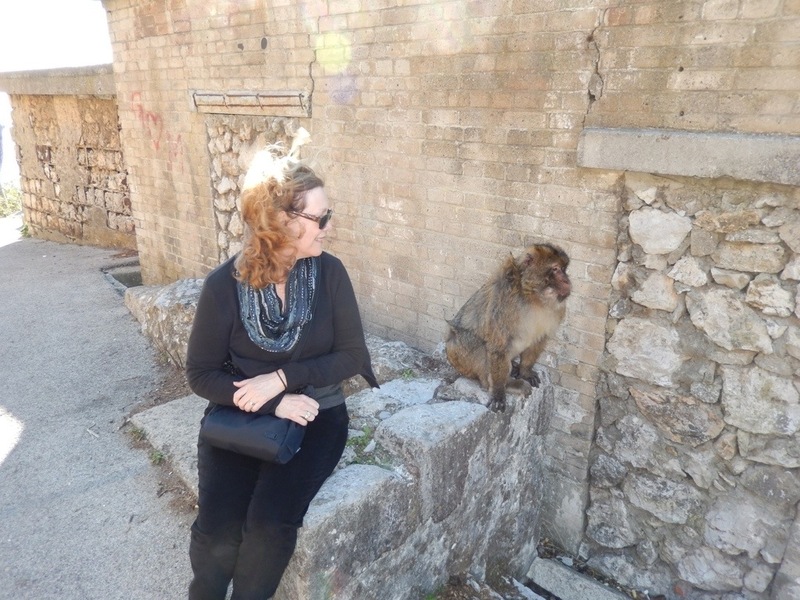 We saw parts of Gibraltar that are not on the tour – a child riding his bike, guard dogs barking, a gang of street youths that looked scarier than the apes did. We were tired and it appeared that we had a long walk down ahead of us. I saw a woman watching her child play and offered to pay her to give us a ride. Bob told her it wasn’t necessary and she declined. I guess she would have anyway. I started hitchhiking every time I would see a car, which was infrequent. Bob had to instruct me on proper thumb placement, but I got the hang of it. The woman had suggessted that someone might pick us up and we might consider limping to look more sympathetic. Limping was no problem. Our entire bodies hurt. We figured we must have walked more than 10 miles up and down hills. We did find ourselves doing well considering, but the more we walked the further it seemed we had to go. Finally a tour guide with two ladies in his van stopped for my hitchhiking thumb. They graciously gave us a ride down. He is my new best friend. When we separated from Joe and Aubyron we decided to meet up at the All’s Well Tavern in town. Seemed appropriate. When we arrived, the sun had completely set and all the places of business were closing up. Time to pray again. This time for Joe and Aubyron to get down the rock. Twenty minutes later they arrived. We decided to head across the border and have dinner in Spain. That would give us an opportunity to rest before the drive back. The border had its own idea. The line to cross the border looked like a bad day at Disney World. We waited 1.5 hours to walk across. The lines for cars were even worse. Periodically they would show their disapproval with a chorus of car horns. Yep, another new experience. Finally we crossed and saw those wonderful Golden Arches. Dinner at McDonalds sounded good to us. Food and a little rest made for a happier drive back to our resort. As I prepared for bed that night I looked like a monkey had been going through my hair and I was tired. It was a great day. Today we did nothing as we required rest. Tomorrow we will venture out again. What an experience, the monkey on your back. It was so much fun, Vanessa. Thank you. I thought about you while going through the cave. Ronda and Gibraltar are amazing.